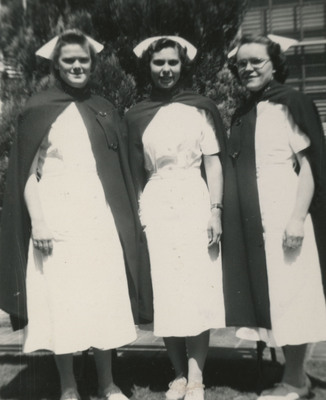 Three nursing students of the Good Samaritan School of Nursing stand in their nursing uniforms. This photograph was previously adhered to one of the Activities pages of the Annual. Please see the Related Resource field to identify the scrapbook page it is associated with. Linfield College-Good Samaritan School of Nursing Collection. Jereld R. Nicholson Library. Linfield College, McMinnville, Oregon. Deposited by Linfield College-Good Samaritan School of Nursing. For a related image, refer to The Activities Page of the Annual 01. Unknown, "Three Nursing Students in Uniform" (1951). Good Samaritan School of Nursing Photographs. Image. Submission 194. This file is an archival master for this image. It is significantly larger in size and will take longer to download than the access copy that is available via the Download Original icon.